Friday in the High School division, sprint champion Iantha Wright of Jamaica, Queens, won the 55M in a fast 7.16, recapturing the lead from Manhattan’s Brianna White of Leman High School who finished second in 7.21. Last week, White earned her first victory in two seasons chasing the reigning champion Wright, who’s a year older and a year ahead in school. White also finished second in the 200M in 26.36, just behind Dominique Jackson of Bronx’s Pelham Prep Academy who crossed the tape in 25.87 for the win. Jackson is rising fast, improving from fourth place to win this weekend’s Colgate Games 200M, then followed up Friday’s victory with a personal season’s record 200M time of 25.27 in the Women’s Varsity division of the Hispanic Games on Saturday at the Armory Track, NYC. Her second place win there was especially notable for a field that included Colgate Women’s Games’ leaders Sophia Myers, Iantha Wright, and Brianna White finishing 3rd through 5th respectively. Hurdles champion Sophia Myers of Queens High School of Teaching remains undefeated with a 55MH win in 8.28. Myers met new competition from a young Stephanie Graves, a 10th grader at Queen’s High School of Law Enforcement and Public Safety, who competed in her first Colgate Games’ hurdles event and came in second with her own personal record 8.56. Jasmine Douglas-Grant of Stroudsburg High School, Pennsylvania won the 400M in 59.59; Brooklyn’s Adia Palmer of Bishop Loughlin won the 800M in 2:19.25, as New Jersey’ s distance champion Athing Mu opted to run only the 1500M this week, which she won in her best time of the series, 4:51.86. Mu’s win was also her latest personal best, after 10th first place wins in major meets where she broke personal records in distances from the 400M to the mile, throughout all of 2017. 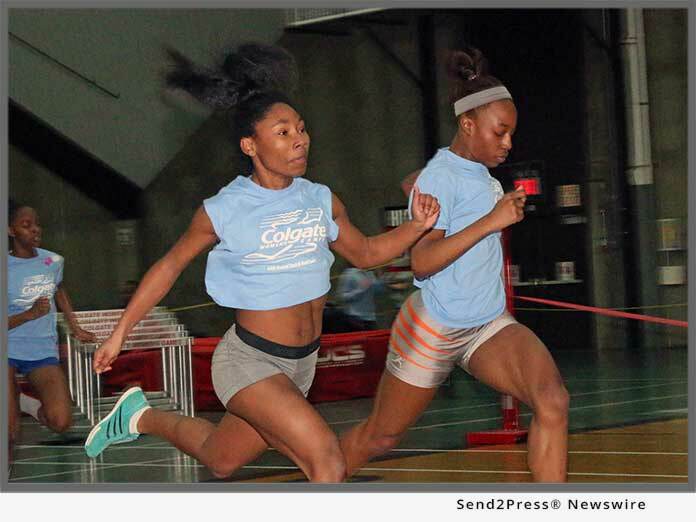 Also on Friday, two-time Colgate Women’s Games’ High Jump record holder, My’khiyah Williams of Brooklyn’s Benjamin Banneker school, cleared the bar at 5’4” for the win, and Shot Put champion 15 year-old Mariam Cisse of Manhattan’s Promise Academy, won with a toss of 11.13M. In the Mid School Division on Saturday, 12 yr-old Avery Lewis of Westtown School in West Chester, PA continues to prove she’s among the nation’s best, with a 55M win in 7.12, just .22 shy of setting a fifth Colgate Women’s Games’ record. For some perspective, that’s less than 1/2 the time it takes to blink. Lewis made it a third double win, with a 200M first place finish in 25.37. Peyton Rollins of Andrews Middle School remains undefeated in the 55MH with a win in 8.31. Rollins who travels all the way from Massachusetts also shared the track with Lewis in the 200M, finishing third in 26.88, just a flash behind Simone Kelly of Wissachickon MS, Ambler, PA who finished second in 26.83; Kelly won the 400M in 1:00.22, followed by Brooklyn’s Tai Sheppard of the Dock Street School crossing the tape in 1:01.32; Sheppard also placed second in the hurdles behind Rollins in 8.37. Alina LaForest of Drexel Neumann Academy, Chester PA won the 800M in 2:20.72; her third consecutive win, and placed second in the 1500M (4:55.97) behind Tai’s sister Rainn Sheppard who placed first in 4:55.97. The Mid School High Jump finished in a three way tie with Bronx’s Bianca Staples, Kayley Lynch of Northstar Academy, Newark, NJ, and Selah Dungey of St. Peter Academy, River Edge, NJ all clearing 4’10”; and Melissa Aymil of Mendham MS in Brookside, NJ remains undefeated in the shot put after a toss of 10.87M, her best of the season and a new personal record. 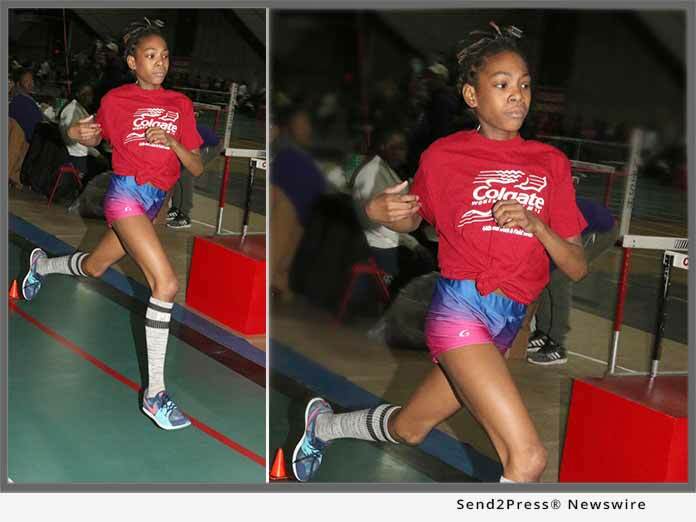 On Sunday in the Elementary B division 55M, Following last week’s tie, Brooklyn’s Kaela Swift of Success Academy Bed-Stuy beat Philadelphia’s Amirah Nesmith by 1/100 of a second in a photo finish that shows Swift won by a nose in 7.91 to Nesmith’s 7.92. In the 55MH, fifth place Kamilah Alabi of PS15 Queens, ran 10.67 for a first place win; In the 200M, Brianna Lindo of Queen’s Riverton Street Charter School, also scored an upset victory, with a win in 28.6 over Kaela Swift (28.92); In the 400M and 800M Colgate Women’s Games champion Damira Allen of Chester School of the Arts, Chester PA, retained a perfect season record with a third double win in the 400M (1:04.14) just ahead of Lindo (1:04.37), and the 800M in 2:26.87; and in the High Jump, Avery Hart of Pierce School, Brookline MA cleared the bar at 4’2” for her third consecutive win. Four preliminary meets and a semi-finals at Pratt Institute determine who will compete at the finals at the New Balance Track and Field Center at The Armory, New York Saturday, February 10, 2018, where trophies and educational grants-in-aid from Colgate-Palmolive Company are awarded to top place finishers in each grade division. (1) High School sprint champion Iantha Wright of Jamaica, Queens, wins the 55M in a fast 7.16, recapturing the lead from Manhattan’s Brianna White of Leman High School who finished second in 7.21; at the 3rd preliminary meet of the nation’s largest track and field series for women, the 44th annual Colgate Women’s Games on Friday night at Pratt Institute in Brooklyn, N.Y.
(2) Rainn Sheppard of MS313, Brooklyn, remains undefeated in the Mid School Division 1500M after her latest victory in 4:55.97, at the 44th annual Colgate Women’s Games at Pratt Institute in Brooklyn, N.Y. on Saturday. "While our sports news generally reports on top- ranked leaders, thousands of girls of every ability are learning to challenge themselves each week to find their own 'personal bests,' and that's what the Colgate Women's Games are really about," said Meet Director Cheryl Toussaint.